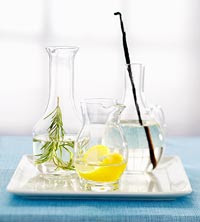 Infuse the syrup with vanilla, fresh herbs, or lemon-ginger for a delightful syrup to serve with fresh fruit, cake, or beverages. In a saucepan combine water and sugar. Bring to boiling over medium heat, stirring until sugar is dissolved. Add one of the infusions; boil gently, uncovered, for 2 minutes more. Remove from heat; cover and cool in saucepan for 1 hour. Remove and discard infusion ingredients. Transfer syrup to a covered storage container. Refrigerate up to 2 weeks. Makes 2 cups syrup. Add one fresh vanilla bean, halved lengthwise, to the hot sugar-water mixture. If desired, after cooling, remove the vanilla bean and use the tip of a small sharp knife to scrape the seeds from the bean halves into the syrup (flecks of dark seeds will color the crystal-clear syrup). Drizzle syrup over slices of cantaloupe, strawberries, or other cut-up fresh fruit. Add three 1x3-inch strips of lemon peel and a 1-inch piece of ginger, thinly sliced, to the hot sugar-water mixture. Proceed as directed above. Drizzle syrup over pound cake or strawberry shortcake. Calories 35, Total Fat 0 g, Saturated Fat 0 g, Monounsaturated Fat 0 g, Polyunsaturated Fat 0 g, Cholesterol 0 mg, Sodium 0 mg, Carbohydrate 9 g, Total Sugar 9 g, Fiber 0 g, Protein 0 g. Daily Values: Vitamin C 0%, Calcium 0%, Iron 0%. This entry was posted on 2:22 AM and is filed under Drinks . You can follow any responses to this entry through the RSS 2.0 feed. You can leave a response, or trackback from your own site.